We arrived at night, doing a walk-around our rental car using the flashlight on our phones. Then, one by one we loaded up our suitcases and hit the road from Maui’s Kahului Airport, looping down around the coast to the Kaanapali Beach resort area. We turned on the radio and the sweet sounds of 93.5 KPOA welcomed us to the island. My first and only previous Hawaiian visit was back in 2012 for the inaugural Kaanapali Fresh food festival with John. 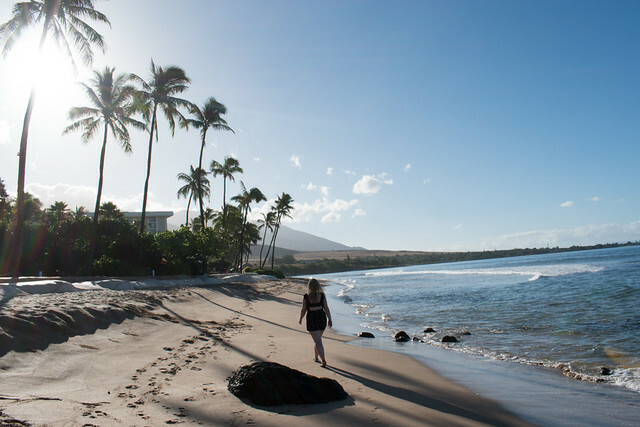 Now, five years later, I was coming back with my sister, a woman very deserving of a tropical getaway, and I knew Kaanapali would be the perfect place for her to unwind — and also get in a little adventure. Pulling up to the Hyatt Regency Maui Resort and Spa, we were greeted by the friendly valet and I headed in to the lobby to check in. Welcomed with beautifully delicate floral leis, we felt like royalty right away – even though this is a standard greeting for all guests at the Hyatt Regency Maui. Rolling our suitcases through the lobby and into the grand courtyard, the rest of the resort’s landscape came into view. Lush gardens, birds, pineapple plants, and this was still just inside the hotel! 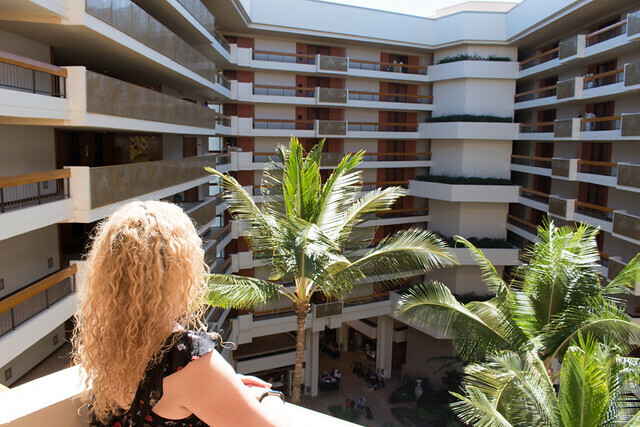 Once the elevator doors opened on our floor, we looked down at the courtyard, where an ocean breeze swept up through the lobby and met us 19 storeys up. In our room it was like Christmas morning. There was fresh-cut pineapple in a bowl, and fresh pineapples hollowed out waiting for us to pour in a Mai Tai mix. Hyatt Maui pineapple cookies were on a plate next to some awesome pink swag for the Paddle for the Cure we were going to do in a few days. We poured our Mai Tais into the pineapples, snapped a few obligatory photos for social media, and stepped out onto our ocean-view balcony. It was late enough that live entertainment down at the poolside restaurant had ceased, however the sound of the wind and waves was all we needed to unwind. We sat out in the warm South Pacific air, above the palm trees, wearing our new pink hats and leis, sipping from our pineapples, and my sister turned to me and said: “This is the Hawaii you dream of. And it’s real.” Little did she know just how much more “Hawaii” our experience would get, but this was a pretty awesome start. 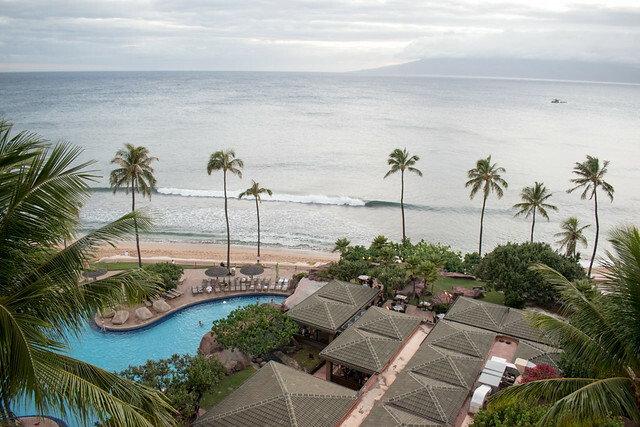 Maui’s beautiful West Coast is home to the Kaanapali Beach Resort Association, a thread of hotels and resorts all connected by one beach path, and each property is as unique as each of the Hawaiian Islands themselves. 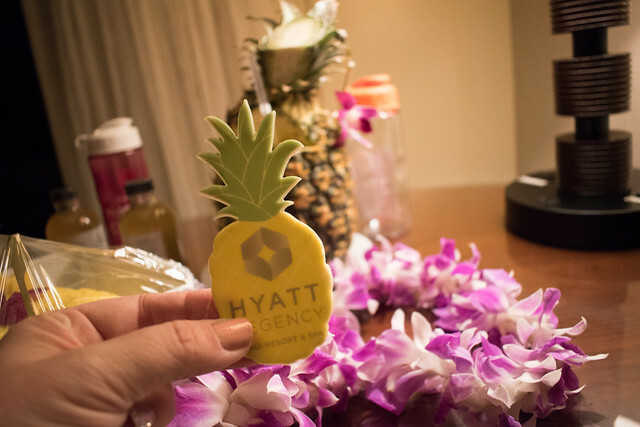 The Hyatt Maui is the southernmost resort, and it was the perfect place to start our Maui experience. 1) The pool & the beach: “Why go to a gorgeous tropical island and spend all your time at the pool?” I overheard a traveller remark when I was sitting at the airport. 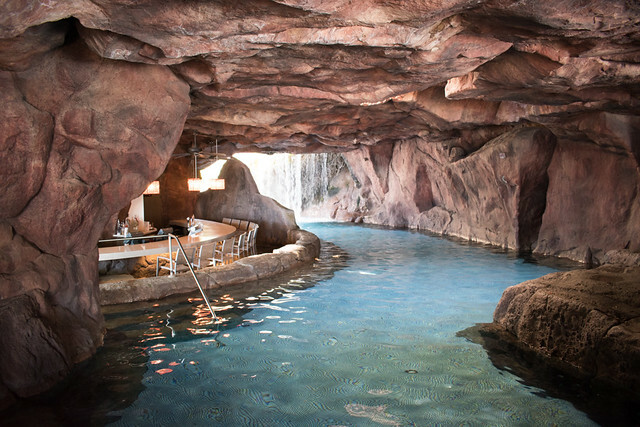 Well, when you can swim in the ocean waves, shower off, walk back up to your chaise lounge, order a Mai Tai, then float under a cascading waterfall and have it delivered from the grotto bar adjacent to said waterfall. You can truly have the best of both worlds. My sister is a single mother of four (who works full time and just finished school) and while I’m sure she’s very likely to return to the Hyatt for a family vacation, where the kids can splash in the family pool and ride the waterslide, there are adults-only pools too for just an occasion such as this. 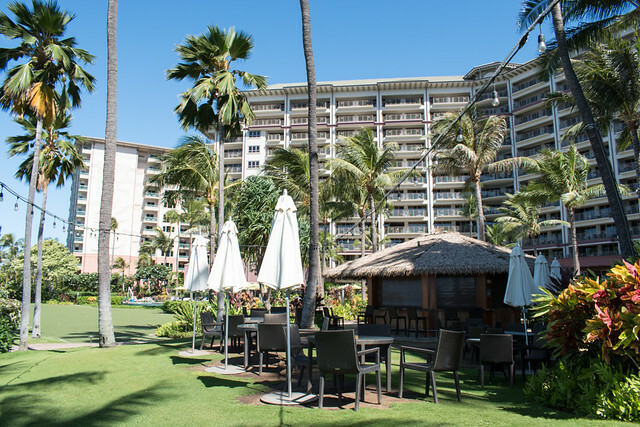 2) Food & Shave Ice: “The lines at Ululani’s Hawaiian Shave Ice in Lahaina are usually so long, but it’s the best shave ice on the island!” Another comment I overheard but luckily the Hyatt Regency Maui has it’s very own Ululani’s right on the beach. When your day in the sun comes to an end, book a table at Japengo, a delicious fusion restaurant that proudly promotes local ingredients and even lists their farm and fishing partners right on the menu. A little icon of the Hawaiian Islands also appears on the menu next to dishes featuring these local picks and catches. 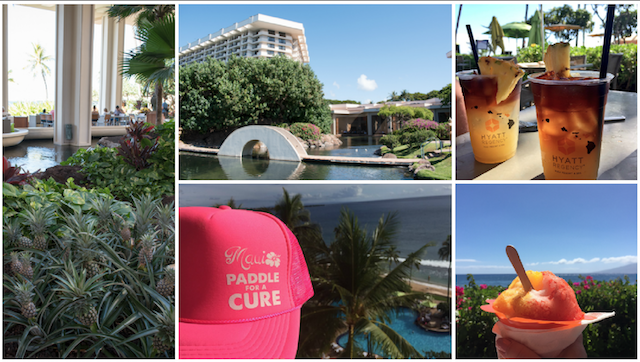 3) Paddle for a Cure: I love promoting and participating in local non-profit campaigns, and when the Hyatt Regency Maui asked if I would cover their annual Paddle for a Cure for breast cancer awareness and support, I signed my sister and I up for the first available two-person kayak. 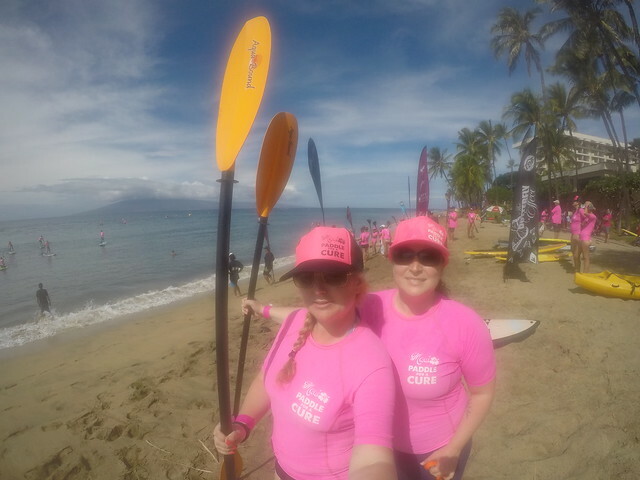 Over a hundred participants donned their pink rashguards and paddled from the Hyatt Regency Maui up to Black Rock over 2km away – and back. 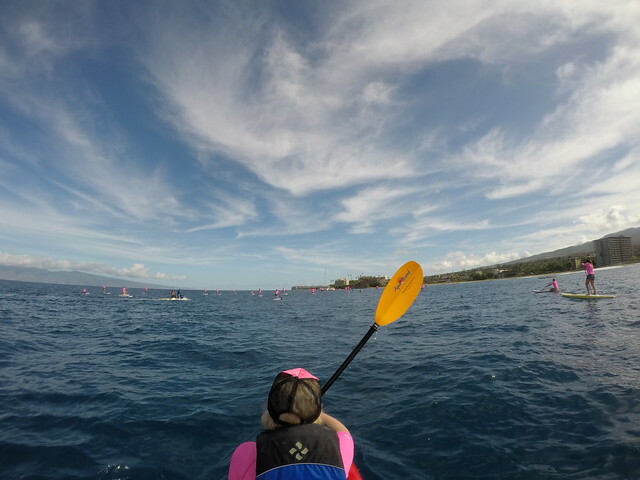 It was an amazing sight to witness all along Kaanapali Beach and when the paddle was done, participants, survivors, and supporters welcomed everyone back on the sand with a special paddle salute. It was a very moving experience. 4) Marilyn Monroe Spa: “A massage is just a massage,” you might think. 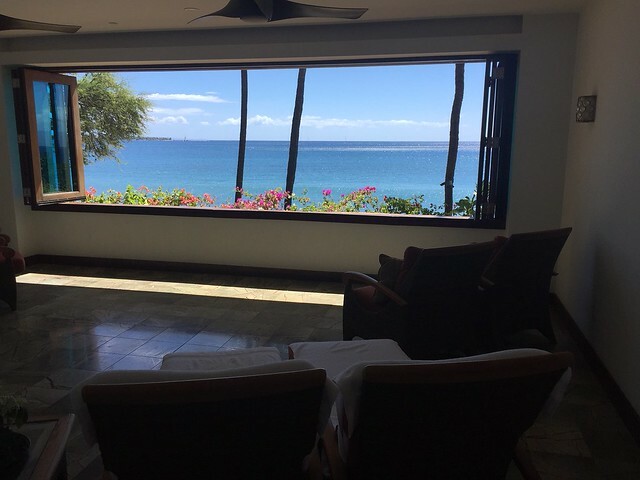 However, Lomi Lomi is considered the foundation of Hawaiian healing therapies and you can book an exclusive Lomi Lomi massage, and many other treatments, at the Hyatt’s beachside spa. 5) Tour of the Stars: We didn’t do this, and I really regret it! So, I’m posting it here to remind me to book a tour the next time I visit. The Hyatt Regency Maui offers this stargazing experience through their very own rooftop astronomy program. They have romantic star tours, with champagne and chocolate covered strawberries, as well as family packages. We also really loved the location. It’s not right in the heart of the Whaler Village (the hub of shops and restaurants in the heart of Kaanapali) but it takes less than ten minutes to walk over there. It’s quiet but you’re so close to the other amenities and action if you wish to head to that area. In the meantime, you have shops (even a Macy’s) at the Hyatt, restaurants (and delicious Honolulu Coffee), and water sport rentals (kayaks, snorkels, you name it). The Hyatt Maui was a great home base for some other adventures, which I’ll post about in the coming weeks, including a massive hike we found online (and that came personally recommended) that left me breathless but so thankful to accomplish. 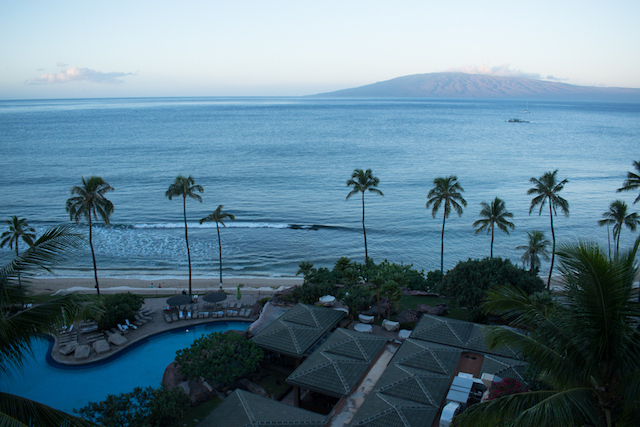 To plan your next vacation to Maui, touch base with the Kaanapali Beach Resort Association (“KBRA”). They have so many resources, properties, and activities that there’s bound to be a perfect fit for you too. Follow along on Facebook, Twitter, and Instagram. This post is published in partnership with the KBRA, and while our hotel stays were media comps for review, activities, meals, and other expenses were our own. Views are my own. 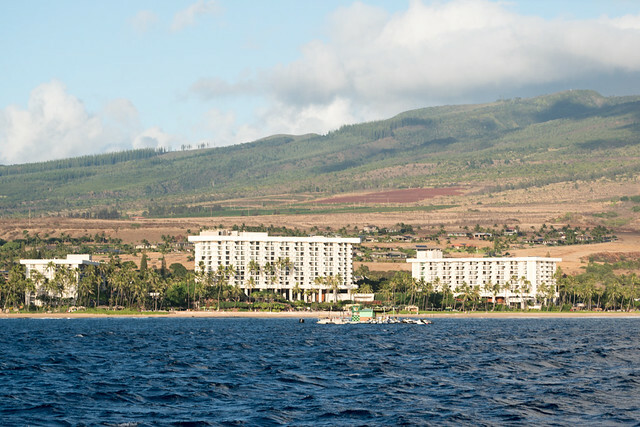 This post is published in partnership with the Kaanapali Beach Resort Association. Great story Rebecca. So sorry I missed you but thank you for coming and participating in “Paddle” as well. Awesome sister time! Love Maui! I need to go again as I was last there in 2014, way too long!